I’ve decided that I’m most thankful for bread. 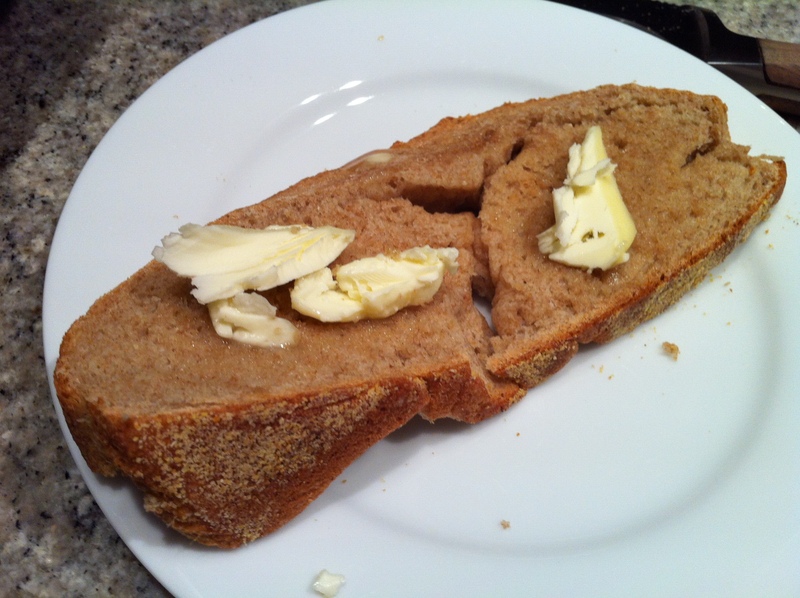 And what could possibly be more comforting than a slice of freshly baked bread slathered with butter? Nada. Because I’m a busy gal with a full-time job, I don’t really have time for multiple rising and resting cycles… the solution? King Arthur Flour’s foolproof hearth bread recipe. 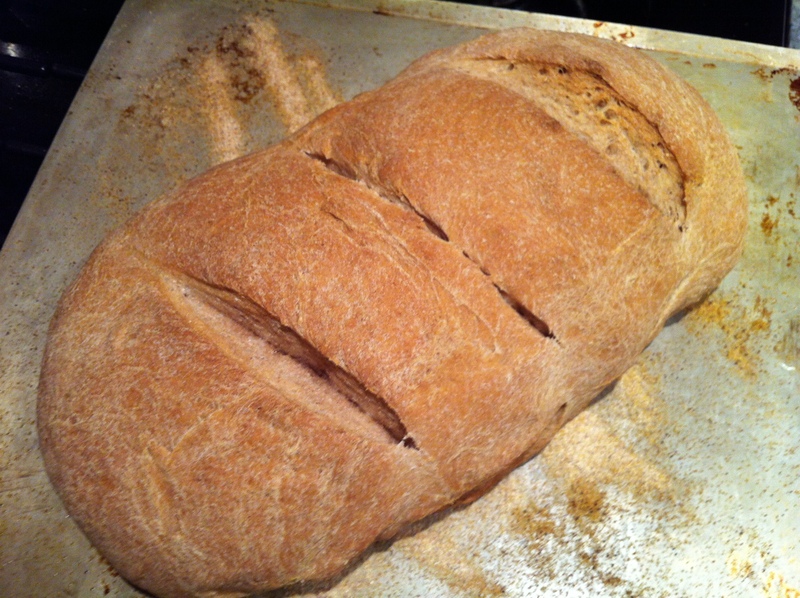 5 1/2 to 6 cups King Arthur Unbleached All-Purpose Flour — I used two cups of whole wheat! Combine the first four ingredients in the bowl of an electric mixer fitted with the dough hook attachment (if you don’t have an electric mixer a regular bowl and wooden spoon will do fine!). Wait until the yeast comes to life — it will bubble and froth a bit. Then slowly add the flour until the dough becomes a semi-manageable ball and pulls away from the side of the bowl. Turn it out onto a floured board and knead for about 5 minutes. Then put it in an oiled bowl to rest and rise for 1-2 hours or until it has about doubled in size. Punch the dough down and shape it into one or two loaves, place them on an oiled baking sheet sprinkled with cornmeal and bake at 400 for about 35-45 minutes or until the crust is golden brown. As soon as you can bear to touch it, hack of a slice and slather it in butter. This entry was posted in Butter, Festive Cheer and tagged bread, flour, hearth bread, King Arthur Flour, yeast. Bookmark the permalink.